Like pizza and sushi, burgers are one of those far-flung foods. They're just one of those easy to eat creations that hit a lot of pleasure points and are adopted as fast, fun fare around the globe. And I've traveled the world to try them. One of my earliest fast food memories was eating at White Castle (of Harold and Kumar fame) in New York. I've sampled the famously expensive DB Burger by Daniel Boulud, the BLT Burgers by Laurent Tourondel, and the classics at Shake Shack's original location. In Washington, I ate countless times at Five Guys and BRGR. In California, I hit Umami Burger and In-N-Out Burger. In London, I tried Byron (before it got all controversial). In Vegas, I enjoyed Gordon Ramsay's BURGR. 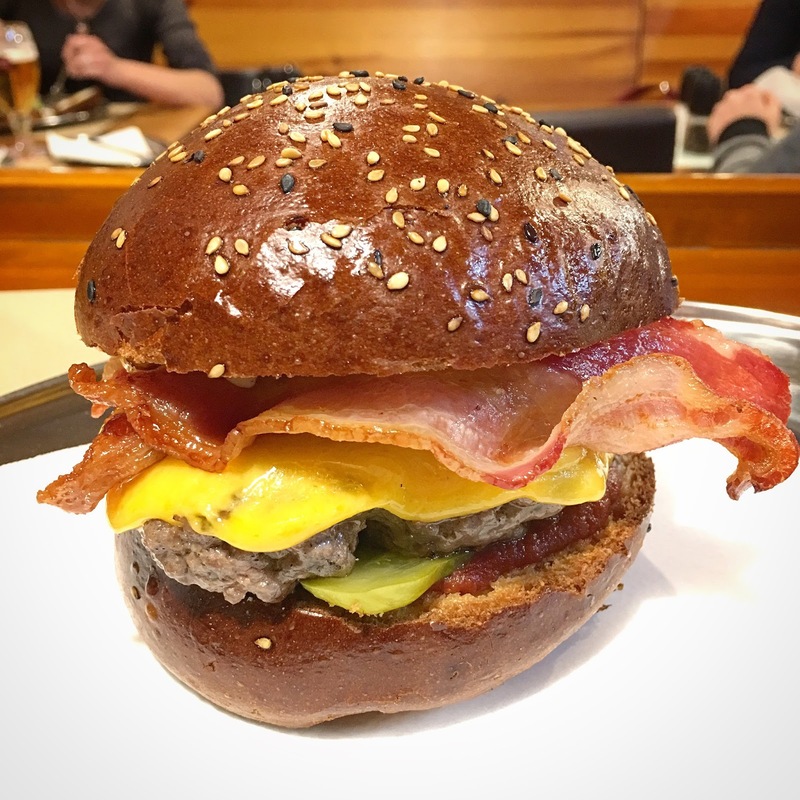 Prague is a burgeoning burger town, and I tried 30 for 2016. It was the best year yet for quality, and I can recommend the top 17 from my list below. As I present my ninth annual burger ranking, I'll do my best to explain what sets one above another for me. It must always be pointed out that there is no such thing as "the best" for everyone. This is a subjective endeavor, based on my personal tastes and a hell of a lot of obsession-driven experience. I prefer beef that is flame-grilled or griddled with a seared crust, cooked medium, and liberally salted. I like lightly crisp, smoked bacon. Toppings are better on the top or the side and should be sliced thin. On the bottom, they get warm and soggy. Buns are important. They must be toasted and hold together but not too dense. Well-balanced construction counts. The most important factor is the right quality and grind of beef -- coarse, not too fine -- with a fat content of at least 20 percent. If the burgers got better, worse, or changed significantly the week after I was there, that's too bad. They are rated as eaten. If you have a different opinion, that's great, but remember, you didn't eat the burger I ate on the day I was there. Almost half of the burgers on this list were new to me. Some from previous years had to be skipped for reasons of time, space, and health (my cholesterol hit "borderline high" this year). This year, I crossed off previous losers and didn't get to a few good ones, mainly for lack of time. This place opened in Vršovice early in 2016. The bun was a travesty, and it wasn't just ugly. The toppings were tossed on haphazardly. The patty tasted like meatloaf. After I posted about it on Facebook, the restaurant's owner wrote to say that their regular chef wasn't working the night I went, so the burger was all wrong. That may be, but they charged me 175 CZK just the same. I was urged to return and have it prepared properly, but I never made it back. The Organic Burger with Parmesan sounds fancy. And they charge a fancy price. It was 260 CZK, plus 65 CZK for fries. One expects excellence from a famous chef like Zdeněk Pohlreich. But this pretentious burger had no true charm. I sent the first one back because the meat was barely room temperature, and the bun was cold. Even if I consider only the second burger, which was warm, but not hot, I did not like it. The patty was dry and underseasoned. It may be high-quality ground beef, but it lacked the fat content to give it the right texture and flavor. The patty dripped juice, but was dry inside. The tomato confit was similar to sun-dried tomato spread. There was scattering of cheese that looked more like a few little snowflakes. The whole thing was bland. I added so many twists from the salt and pepper grinders, I felt a case of carpal tunnel coming on. The large bun was dense and spongy. I got bored with all the chewing and did not finish it. The only real positive: the fries were great. For this kind of money, I expect to smile at more than just the fancy room. I LOVE the steak sandwich at Havana Grill. I highly recommend you check out this hole-in-the wall South American meat spot near Náměstí Míru. One of the best quick, cheap beef bites in town. But the burger? No love. The beef-pork patty had a decent flavor but also a rubbery texture. I can't abide rubbery. I'm not a big fan of hammy bacon either. 155 CZK. There are a lot of food options if you are hanging out along the river at Žluté lázně. I'd recommend you skip this one. The biggest problem was the chalky texture and acrid flavor of the ground beef. The processed cheese had no character. There was lots of mayo and a small amount of crisp bacon, but they didn't cover up the sins of their Classic Burger. It did have a good, buttery bun. It would be better if you were drunk. 185 CZK with decent curly fries. This burger was served at the Sale and Pepe food stand during a festival at Naplavka. The main positive here was the smoky, grilled flavor of the meat. The main negative was that the patty was seriously overcooked, too dense, and chewy. The bacon was undercooked. I don't recall the price. The Beef Bacon Burger's patty was packed too tightly, overground and rubbery. I liked the smoky, crisp bacon and the tangy cheddar. It had quite sweet caramelized onions, celery-caper mayo, lettuce, and tomato. The homemade bun was a bit stale. A friend recommended this cute neighborhood bistro, but I left disappointed. 190 CZK with fries. You will find Burger King on this list every year. In the science of burger rankings, this is what is known as a "control." It's a known quantity and quality (or lack thereof). My annual point is this: If I like a BK burger more than the offering at a real, full-service restaurant, the owners and cooks should rethink what they are doing. It is also on the list to annoy the humorless people who take these things too seriously. Outraged comments about the inclusion of Burger King on the list amuse me greatly. I went for the Angus XT again this year. And again, I did not like it much. The patty was mushy and dry. The barbecue sauce was cloying. The bun was crumbly. 189 CZK with fries and a Coke. A recommendation brought me to Holešovice to try the Hillbilly Burger. The place was packed and had a modern, friendly vibe. The peppery patty was tall, not so wide, and draped in tangy melted cheese. The ground beef had big, chewy pieces in it and was cooked barely medium. It was a sloppy thing to eat. Lots of juices squirted out on the first bite, but the interior was on the dry side. The bacon was rather burnt. I'm not a big fan of rucola on burgers. The pickles were great, but the raw onion was overpowering. 159 CZK with good fries. Thanks to Sandra Trávničková for donating her photo of the burger here -- I forgot to take one. 22. Mozaika Burger and Co. I had the Bacon Cheeseburger, which I believe used to be called the Krystal. It had a thick patty, with a good grind, but I don't think the fat content was high enough. The beef was tightly packed, chewy, and I thought the salt levels were too high. It was cooked medium. The bun was too dense. I loved the sweet and sour pickles on it, and their crispy bacon was incredibly good. There was lots of mayo, plus shredded lettuce. It was very messy to eat. I asked for additional ketchup. It was homemade, which was OK but not as good as Heinz in my book (nothing is). The condiment cost a soul-crushing 35 CZK. The burger was 214 CZK, and fries were an extra 49 CZK. The place was packed when I was there, and lots of people clearly like it, but it just didn’t do it for me. This rooftop spot, accessed via a grungy, small elevator next to the Kotva department store, has one of the best views of Prague's Old Town. In the warm-weather months, it is hard to get table up there without a reservation. Their burger was cooked over flame, giving it a lovely backyard barbecue flavor. Unfortunately, the ground beef was not of the highest quality, and quite chewy. At 269 CZK with fries, it wasn't cheap, but I'd get it again next summer. I had the 200-gram burger earlier this year (though the internet menu now lists the burger weights at 180 grams and 270 grams). The bacon was cooked properly and was crispy but not smoky. The gooey cheese didn't have much flavor beyond salt. The patty was also very salty and had an odd seasoning I couldn't identify. Adding ketchup helped balance it out. There was lots of mayo. The lettuce wilted under the hot meat. The bun was nice, but it was not well-toasted. It was super messy to eat. 195 CZK including fries. The burger was well-constructed. It was made with good ground beef, seasoned with salt. However, the patty was too dense and chewy. The toasted bun was a bit stale, but it held everything together well. The melted yellow cheese slice didn't have much character. The bacon was soft and hammy, but it did have a good smoky flavor. There was a ketchup-mayo sauce on it, and I really liked the sliced pickles. 185 CZK plus 55 CZK, for the fries but I really didn't like those. They tasted like they were fried in old oil. This burger and dog spot took a summer break and never came back. It's too bad, because they made a tasty, well-constructed burger. The cheese melted into the patty. It was made with great beef, which was tender, but the grind was a little too fine. Enjoyed the crispy, chewy bacon. The onion and tomato were sliced thin, for easy eating. The bun was a little too tall and bready. It was 144 CZK, but it is no longer available. The space on Vinohradska was taken over by WingHaus. This tiny butchery is popular with locals and tourists alike. Just getting in the door can be a challenge at peak times. I bought ground beef patties there and made amazing burgers on my grill at home. I'm just not a huge fan of the burger they serve in the cramped shop. Their meat is generally excellent, but my burger came out pretty rare, with a cool center and a big piece of gristle. It's not very large. They served it, as always, on a small Czech poppy roll, not a burger bun. It was topped with onion, and I swapped their standard mustard for their fairly bland homemade ketchup. Overall, it's worth trying, but I just can't feel big love. The dedicated beef restaurant opened this year near the Tesco at Národní. The flame-grilled flavor of the meat was my favorite part of the experience. The high-quality beef had a good, coarse grind. The thin patty was cooked medium. The large brioche-style bun was spongy. The cheese was rather bland. There was lettuce, chopped onion, mustard, and a tiny bit of ketchup. They charged for the extra ketchup I got. The pickles were cut too thick and they threw the lettuce on in a haphazard way. The 100-gram burger was 165 CZK with fries. They also do a 200-gram burger for 265 CZK. I had the "mini burgers" here. They also have full-sized burgers, but I prefer the smaller size. The ones I had at the beginning of the year were just OK. The one I had in November was much better. So consistency was an issue. The last one had a good coarse grind on the beef, which picked up nice flavor from the grill. It was cooked all the way through, not medium. It was a bit dry inside. The bun was baked, not toasted, so it was also dry, and the outside flaked. There was lots of mayo. There was lovely, crispy, salty bacon. I really liked the sharp, tangy cheddar. It also had red onion, tomato, and lettuce. Construction could be better -- lettuce sometime stuck out awkwardly. 89 CZK for one, 169 CZK for two. I give extra credit to burgers that taste like they've touched flame, and this one had it. It was cooked a perfect medium, though the grind was too fine and the fat content too low. Still, it was tender and easy to bite. The cheddar picked up some of the smoke from the meat. There was excellent smoky, crispy bacon. The burger came with an onion jam that I found a little too sweet. Adding the salty mayo-based sauce on the side balanced it a bit. They gave me a bottle of Heinz ketchup, but I didn't want to add to the sweetness. They didn't serve it with frills like lettuce, tomatoes, or pickles. The thing that set this burger back most was that the top of the bun was charred black underneath. It cost 245 CZK, including homemade fries that were undercooked and soft. I went another time, and they were crunchy and much better. The Cheeseburger here was one of my top favorites last year. This year's version had less of a grilled flavor I loved so much. Still, they make it with quality beef and a proper, coarse grind. The relatively thin patty was cooked medium. The bacon was smoky but soft and hammy. It had mustard and a tiny bit of ketchup, plus chopped onion, and pickles sliced too thick. The brioche bun was large and spongy. Cheddar was listed as the cheese, but it was fairly bland. Overall, pretty good. 145 CZK, with an extra charge of 45 CZK for fries and a small salad. Ketchup costs extra. This place was started by alumni from Dish. I had the MAG Burger. The well-salted patty was very juicy and cooked medium. The very soft bun held together throughout. 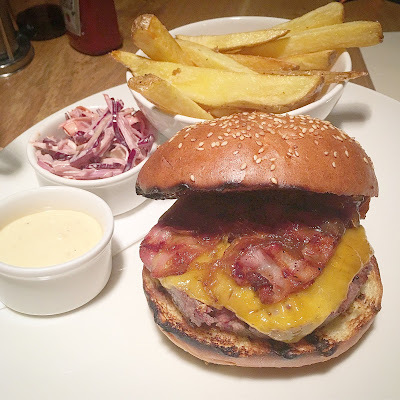 The bacon had some crispness, though a burger I had earlier in the year had more ham-like bacon. The "gratinated" tomatoes gave it a lightly sweet note. Their homemade ketchup was more like sweet tomato sauce. There was garlic mayo. The heavy saltiness had me wishing for tart pickles to balance it. The MAG Burger was 185 CZK. Fries were 45 CZK extra. Ordering extra ketchup to go with fries cost 29 CZK. The Dirty Burger was a Saturday night special and not on the regular menu. It had two outstanding things going for it. One was the great, funky flavor of the dry-aged ground beef from Real Meat Society, which is also owned by Chef Paul Day. The other was the pillowy, toasted potato roll. I'm still dreaming about its buttery goodness. The patty was cooked medium, and the grind was just right. It was topped with melted cheddar, chopped, fried onion, pickles, and soft bacon. I wished the flavors of the bacon and pickles were more assertive. I added a touch of ketchup to give the burger some tangy sweetness. Size-wise, I'd say it was a small burger or a large slider. It was served in a paper bag with fried potato strings that weren't so easy to eat. 195 CZK. I had the American Dream Burger. There was high-quality ground beef with the right grind. The patty had a peppery flavor. When combined with the Sriracha mayo, there was a spicy kick. The meat was cooked all the way through, not medium as requested. This burger dripped quite a lot on the plate. They used a buttery bun that was well-toasted and held the hefty burger together. It had shredded lettuce, tomato, red onion, and long pickle slices. The very smoky bacon was delicious. I didn't write down the price, and it was not listed on the Prague online menu. But it said their burgers were between 185 CZK and 255 CZK. The Classic Bacon-Cheddar was good and messy. First, let me say, their bacon was awesome -- crispy and smoky. They use good, tangy cheddar. Their patty was loosely packed, ground coarsely, and easy to bite. The thin patty was cooked medium. It normally comes with mustard, ketchup, and mayo, which was always too much for me. This year, I remembered that and had them leave off the mustard. There was still a ton of mayo, though. Shredded lettuce helped balance the construction -- no awkward lettuce sticking out. The bun was better and didn't seem heavily steamed as it did before. Great pickles on there. 219 CZK plus 49 CZK for fries. The burger was built beautifully. The blend of chuck, brisket, and rib meat from Czech Angus was ground in-house. The thin patty had a great sear from the grill, keeping it juicy on the inside. The bacon was crisp, the tomato was sliced super thin, and the cheddar was sharp. The brioche bun was made on the premises. The hint of star anise in the onion chutney didn't work for me, and the burger wasn't hot enough the first time I was there. Both of those issues were corrected on later visits. Sad to say, Urban Stay Cafe went away at the end of 2016. I'm a real fan of Chef Luigi Falcone. He's a master of the kitchen, who clearly puts creativity, passion, and hard work into his food. You can taste the love. I hope he'll do something else in Prague someday. The star attraction of their Black Angus Burger was the intensely smoked flavor of the ground beef prepared on their Josper grill. The loosely packed, coarsely ground patty had the right fat content. The only issue was it was cooked well done instead of the requested medium. There was seasoning in the meat that I couldn't identify and that made the flavor less classic. They used great cheddar and a quality bun. It was topped with sweet, caramelized onions, and a little too much salty mayo. This tall burger was very messy to eat. As good as it was, I still thought it could be better with bacon, which was not an option. It was 195 CZK when I had it early in 2016, but the online menu says it is now 229 CZK. Comes with great fries. This place is super popular, and I was turned away once for lack of a reservation. That was how I ended up at Next Door by Imperial, and you know how that ended. 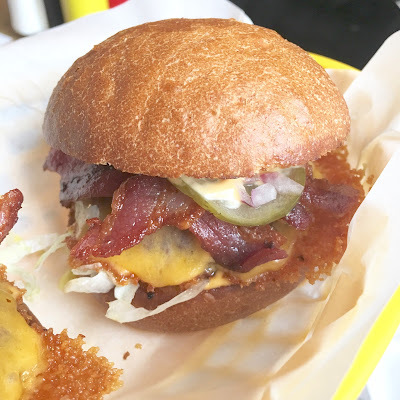 The Royal Bacon Cheeseburger had top-notch bacon, crispy and smoky. And there was plenty of it. It was really good, except for one cold strip that slipped out from under the bun. The patty had a satisfying, coarse grind, and the clear, beefy flavor was brought up by the right salt levels. It had a well-made, toasted brioche bun, but the outside flaked off a bit, like it had been warmed up in the oven. They didn't go overboard with the herb mayo or the homemade ketchup. There was just enough. The cheese didn't make much of an impression, but the assertive sour pickles did. The burger didn't come with lettuce or tomato, and I didn't miss them. It did include crispy, fried onions that were overcooked and chewy. 175 CZK for just the burger, 209 CZK with fries and slaw included. The GPS Burger, available only in the bar, was the most expensive of the year. It was also very good. It was well-constructed, everything in balance, resulting in a handsome burger. The toppings -- sour pickles, tomato, and onion -- were thinly-sliced. The grind of the beef was too fine, but the patty was tender, not too tightly-packed, with nice fat content. It was juicy. I wished for more flavor from the grill, which was present in last year's burger. The chipotle mayo caused a satisfying heat to build. The cheddar was sharp, and the buttery brioche bun held it all together. The bacon was glazed with maple syrup, giving it a terrific sweet and salty character. The price was 375 CZK, which included my favorite fries of the year. I think the owner of dish has traveled the world in search of great burgers. Their offerings remind me a lot of Umami Burger, which originated in California. The Dish Burger's relatively thin patty was cooked medium. I've sat at the bar many times, watched the raw patties being thrown on the grill, and seen that they had good levels of fat mixed in there. The grind was coarse, and there was no gristle like I've had there in previous years. The patty, with a hint of char from the grill, dripped quite a lot of juices on the plate but remained moist inside. It had tomatoey homemade ketchup and too much garlicky mayo, which overshadows the flavor of the beef. Their crispy, salty bacon had a lightly smoked flavor. The very melted cheese didn't stand out much. They always place their lettuce carefully so it looks good and doesn't stick out too much. I really liked the sweet and sour pickles they use, which cut through the saltiness of the burger. Overall, it was the most balanced, well-built, and easy-to-eat burger. It was 209 CZK when I had it, but the online menu now says 215 CZK. Ironically, I liked the Tavern Classic Bacon-Cheddar Burger here more than I did at The Tavern. They're both owned by the same American couple, and both burgers were good. This one was just more satisfying. It was certainly not the prettiest, with all that bacon sticking out everywhere. But oh, what great bacon it was. And it might have been the most bacon I'd had on any burger. I had to break the long strips in half and place them in a more orderly way on the burger, which was a messy business. But once done, it was a bacon burger bomb. The cheese was also the most cheddary I can recall. I got it without the usual mustard -- just ketchup and mayo. The quality ground beef, with a respectable fat content, was cooked medium. Sour pickles punched up the flavor. Except for the bacon and an excess of mayo, the construction was good. The poppy seed bun was a good one, but needed a better toasting. The patty sat on shredded lettuce, and there was raw red onion on the side. 219 CZK and fries were 45 CZK extra. A lot of thought and love went into the creation of this burger. The custom blend of beef is ground in-house. The patty, cooked medium, picked up great flavor from the grill. The aged cheddar did not have a strong flavor on its own, but picked up some smokiness from the meat. The fat content was at least 20 percent, making it quite juicy and tender, but also very drippy while eating. The coarse grind was on the mark. The bacon was perfectly crispy. The brioche bun was just right. There was mayo on the bottom and mustard on the top. I really liked that the cool toppings -- shredded lettuce, tomatoes, red onions, and pickles -- were prepared in proper proportions, and kept separate from the hot meat. They put a bottle of Heinz ketchup on the table for you, no extra charge. I added some. The cost was 269 CZK, and included nice curly fries. One big factor helps me decide on my favorite burger or, in this case, a slider. And that is how often I return for more. Burger fatigue set in many times, and yet I found myself craving Mr. HotDog's offerings on a regular basis -- more than any other burger. Even though I live on the other side of town, time and distance did not deter me. Their Bacon Cheese Slider was just so classic, I found it addictive. The ground beef had a great grind, juicy fat content, and the right salt levels. The salty cheese melted off the side of the patty, forming a little crust. The combination of their tangy slider sauce and sour pickle slices balanced the savory side. Shredded lettuce and diced red onions added crunch and punch. They bake their lovely little buns in-house. I added a little ketchup, provided gratis in a red squeeze bottle. I also like their snappy dogs and special offers, including Thai soups and occasional lobster roll Sundays. I think it's a cool place run by people who know how to cook. And they make some killer cocktails for around 100 CZK. It's not big, it's not fancy, but it was my infatuation this year. One Bacon Cheese Slider was 89 CZK, two were 169 CZK, and three were 219 CZK. A side of good, McDonald's-style fries costs 39 CZK, and a full basket was 79 CZK. That's my list for 2016. Feel free to agree, disagree, and/or share your own rankings in the comments.